Philip Sardo is a successful businessman, an inventor, a family man, a dreamer, and an accomplished musician. Originating in the iconic city of Boston, Phil is one of seventeen brothers and sisters many of who are also skilled players of a variety of musical instruments, as well as talented practitioners in other fields of entertainment and creativity. A life long harmonicist, Phil has played most, if not all, of the best harmonicas available over the years. While there certainly have been many fine instruments made by names most of us have heard, the perfectionist in Phil continued too seek that elusive sound he imagined could exist; if only all the right elements were brought together. The Stradivarius violin has a wooden body, strings, a bridge, and tuning pegs just like all other violins. But something that seems to defy the craft of woodworking or the science of acoustics is somehow forged into a Stradivarius which makes that special, ethereal difference that separates it from all others. As magical as that may seem, Phil knew that there were real, physical reasons, however subtle, responsible for the final result and he was determined to discover what those were that would make his chosen instrument produce the very best sound possible. 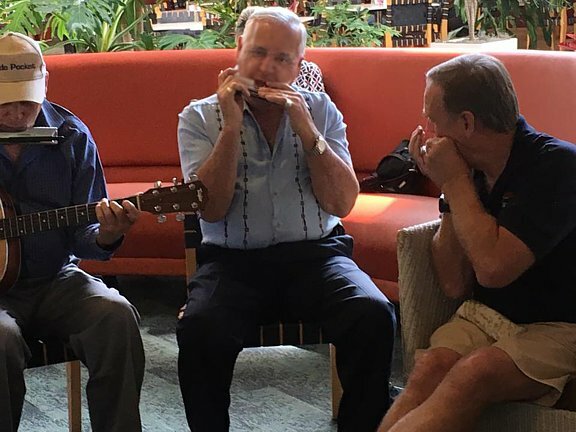 Like all brass and woodwind instruments, the harmonica is powered by air. When you blow into one, the air pressure builds up under the reed: a small piece of brass. This pushes the reed up but because it is flexible it swings back down. While the pressure lasts, the up and down motion of the reed continues at a rapid pace, 262 times per second for a C note for example. It is the pumping action of the reed that sends out the pulses of air that create the sound wave. It is obvious that the regularity of the air pressure is a most important factor in the quality of the sound produced. If the 262 pulses per second is not maintained for an "audible" period of time, the pitch and volume can vary noticeably and harmonics important to the richness of the tone can be lost. Even if the player has extraordinary control, the air can still circulate into any available crack or crevice thus stealing some of the pressure from the reed. Another factor is the shape of the environment where the air travels. It is well understood in orchestral brass that the shape of horn is responsible for the sound that comes out of it. The long, cylindrical tubes, sometimes straight, sometimes curved, that flare out at the end builds up a complex system of pressure waves that reinforce and modulate as they race to the exit and then combine to form a wall of air at the bell of the horn that is pumped out just like air is pumped out by a loudspeaker. We also know that when sound waves hit a flat wall they reflect, bouncing off in the opposite direction and interfering with sounds still coming in. In a small space like the reed chamber in the comb of the harmonica, if the sides and ends of the chamber are flat with square corners, the pressure waves will start reverberating wildly between the walls, destabilizing the air pressure and creating irregular flow patterns that distort the emerging sound. It was now clear to Phil what was needed and he made quick work of it. With imagination, insight, perseverance, creativity, and lots of trial and error, Phil pursued his goal tenaciously through thirty prototypes, slowly closing in on that elusive magic he knew was there, sometimes just a few microns away. The solid brass comb from which nothing could escape; the smooth, rounded chambers that would hold a solid, steady column of air as long as you could blow into it; the recessed reed plates fit into the comb as if mated to it; all the basic pieces started to fall into place. And then inspiration pushed him even farther. With all this attention to the air coming to the reed, he realized that what happens to the waves coming out of the reed was no less significant. In other harmonicas, the air from the reed pours out into open space under the cover pieces. This not only spreads out the wave, changing the character of the sound, but also causes small vibrations in the other reeds that make all the other notes. The ear is amazingly sensitive to the complexities of sound and these added tones, though minimal, can cause modulation to the fundamental note being played such that it "just doesn't sound quite right". Phil solves the problem by designing a reed cover with an underside that is shaped into a series of semi-cylinders, one for each reed set. This completes a sound tube created by the comb chamber below the reed and the enclosing chamber above. The air goes in one end, vibrates the one reed, and pumps out the sound through the enclosed other end. The sound the reed makes is the only sound you hear. All other parts of the instrument that will fit together are redesigned so no flat surface sits on another flat surface without being enclosed by raised edges or set into recesses. Even the tubular reed covers snap into slots between each reed plate to keep air locked in. All this to eliminate any other path for air to go where it shouldn't. That might have been enough for some but not Phil Sardo. All the reeds in a harmonica are riveted to single plates. One for all the blow notes and one for all the draw notes. If one reed gets warped or damaged, the entire plate has to be drilled out and replaced by a service technician. Phil thought that seemed wasteful and inefficient. Why not make each two-note set a separate small plate. And why not set them with screws so the owner can take them out themselves if there's a problem. This single insight gave rise to a host of possibilities. Besides easy repair, the instrument can be custom-tuned for all sorts of music. In fact, the whole reed set can be replaced to change the key of the harmonica whenever necessary and changed again in short order. As Phil has said: "as easy as changing strings on a guitar". An instrument as meticulously designed as this deserved the best materials; all brass parts, stainless steel hardware, and gold-plated mouthpiece, covers, and accents. A work of art for the eye as well as the ear. Thus was born the Stradivarius of harmonicas, the . 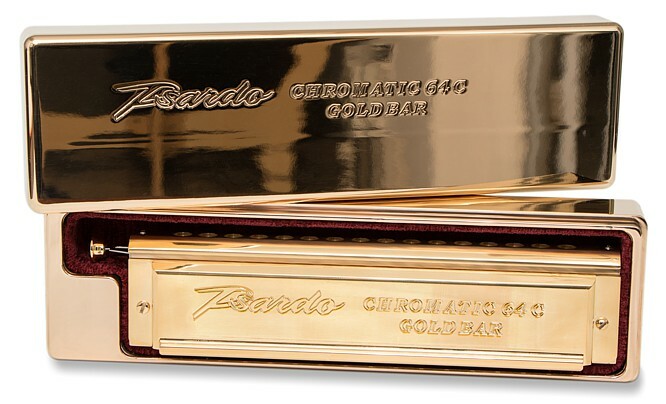 Psardo Harmonicas are Made In U.S.A.